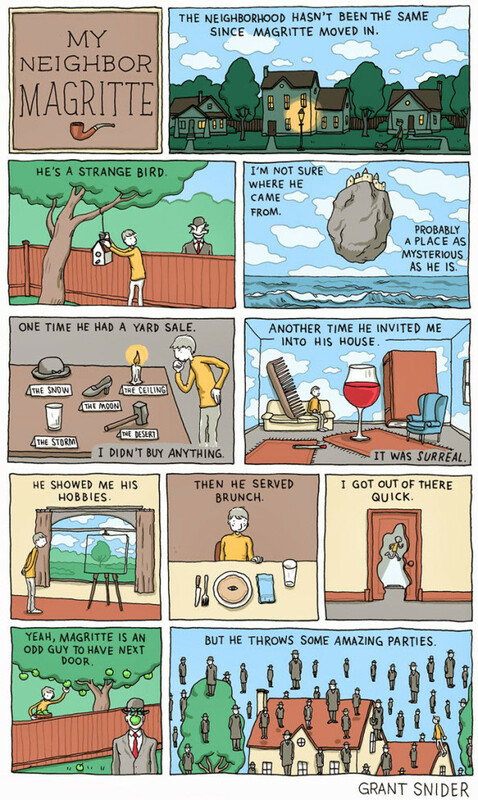 For fans of Incidental Comics, Grant Snider is an interpreter of the brief moments of fancy that catch them unawares. For non-fans i.e. non-readers (because you cannot see his work and NOT be a fan)- read this, because you don’t know what you’re in for. Eye: When did you start drawing? Was it at a really early age or is it something that you discovered as you grew older? 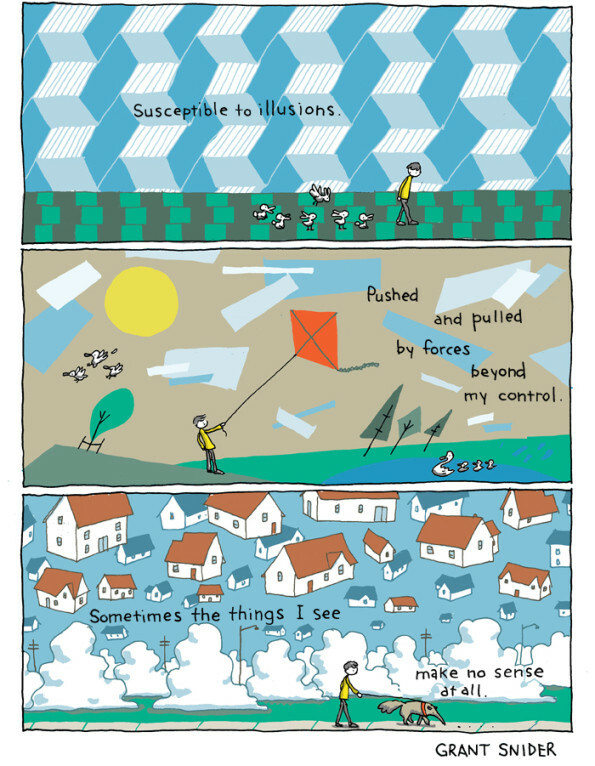 Grant Snider (GS): I drew from an early age and kept drawing past when most people stop, but I didn’t start seriously cartooning until late in college. It was the thrill and promise of publication that sparked my commitment to learning to draw comics. Eye: Who or what inspired you to create comics? GS: I grew up reading newspaper comics – “Calvin and Hobbes” and “The Far Side” were my childhood favorites. As a slightly disgruntled teenager I found more subversive strips, including Matt Groening’s “Life in Hell” and B. Kliban’s cartoons. Around the time I started seriously pursuing cartooning, I was just discovering graphic novels and New Yorker cartoons. Eye: What work do you do beyond ‘Incidental Comics’? GS: I went to dental school and post-dental school residency, and I currently practice orthodontics. I also do illustration work for newspapers and magazines in addition to my self-published comics. Eye: As an artist who are your greatest influences? GS: Mainly fellow cartoonists and illustrators, each with a distinctive visual voice: Roz Chast, Tom Gauld, Bill Watterson, Matt Groening, Saul Steinberg, J.J. Sempe – I could go on and on! Eye: Tell us about your some of favourite cartoonists, artists and writers. How do you incorporate the influence they’ve had on you into your work? GS: For some artists and writers, I incorporate their images and themes directly into my comics – for example, I love the novels of Haruki Murakami, so I drew a comic (“Haruki Murakami Bingo”) summarizing the recurring themes of his books. For painters such as Rene Magritte, I’ve incorporated some of their images into comic strip form. This borrowing and referencing is extremely fun, and it’s a way to pay tribute to some of my favorite artists while also delving deeper into their minds. For contemporary cartoonists (Roz Chast, Tom Gauld, etc.) their influence is less direct but perhaps more important. I study their work for its use of composition, line and voice – I think my style is a result of attempting to match their brilliance. Eye: Your work is something that most of us would refer to as visual poetry. What is some of the poetry you read in real life? Who are the writers that continue to inspire your narrative? GS: Lately I’ve been reading everything I can find from former US Poet Laureate Billy Collins. His use of strong imagery, clear words, and abundant humor is hugely inspirational. Eye: A lot of your work explores day to day dilemmas and happiness. How do you identify a moment and transform it into an epiphany? Do you go out of your home every morning looking for the self realisation you stumble upon? GS: I try to capture small moments in my sketchbook in rough, loose scribbles. Later, if the moment suggests a larger narrative, I’ll try to build it into a full-page comic. It’s increasingly hard to identify which scribbles should be given the attention and time that a finished comic page requires. Eye: How do you make the individual become a part of the art that they experience, as seen in ‘Georgia’s World’ and ‘My Neighbour Magritte’? Is the ability to completely lose oneself to the art that surrounds people something you wish to inspire in your readers as well? GS: I like doing those kind of strips, since they basically draw themselves. I collect my favorite scenes or images from an artist and imagine myself interacting with them. If it successfully translates the experience of losing oneself in art, then I’ve accomplished something worthwhile. Eye: Your work tends to celebrate a lot of movements in modern art such as Futurism, Dadaism, Suprematism and so on, Is there a certain transformation you go through as you move from one phase of art to another? GS: Though “movements” are a simplistic way of categorizing the history of art, It’s fun to explore the themes that guided the artists as they create. I often try to connect the themes of the art movement to a broader point about life. Eye: You create a space for collective introspection by discussing familiar contemporary experiences and observations which is always accompanied by something incredibly honest. How do you as an artist, bring that kind of honesty to your work? Do you ever feel any reservations about sharing something so personal? Or is vulnerability something you feel is necessary for an artist to be able to produce the kind of work they want? GS: Actually, I often feel that my work is not honest or personal enough. Though I’m sharing certain inner thoughts and feelings, I rarely touch on deeper, darker psychological themes, such as those tackled by great literature. I’ve never shared anything through my work that made me uncomfortable, though I hope someday I’ll have the artistic courage to do this. Eye: What do you have planned for ‘Incidental Comics’? GS: I hope to create new comics weekly and continue to find excitement and visual inspiration in the world of ideas.